Stephens got her season off to a solid start with focused play in her match today against Soler-Espinosa. Despite utilizing guile and her foot speed, Soler-Espinosa was no match for Stephens’ power or shot placement. Stephens was engaged from beginning to end and maintained her composure throughout, making very few errors to completely dismantle the weaker game of Soler-Espinosa. She won easily 6-3, 6-1. 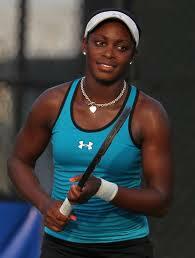 Stephens will look to build on this confident start in her next round against [CR54] Lauren Davis (USA). They have split their two previous encounters, which have gone the distance, so victory is not guaranteed for Stephens; however, if she plays as cleanly and as aggressively as she did today, she should win.